High rise access and high dusting are some of the specialty services we provide. This may include climbing 200 feet where safety is a concern to change a light bulb or to vacuum beams and ledges where dust has built up over the years. The accumulation of dust is often an overlooked health hazard in the work environment. Below is one of many existing statistics regarding the hazards caused by indoor air pollution. Presto staff is trained to use the safest techniques possible to get the job done right. 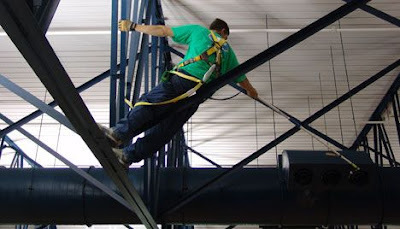 We use the finest equipment and techniques in the industry to ensure a safe working atmosphere. Further, we are currently developing SporeTech Solutions to better combat and prevent the hazards of poor indoor air quality. Look for updates on this in the future.